Any southerner worth her grits knows that the U.S is firmly and epicurean-ly divided by the North-South, Mason-Dixon line. It's a long, sad border-line, carved by the tears of displaced Southerners lamenting over the complete scarcity of this staple in northern locales. 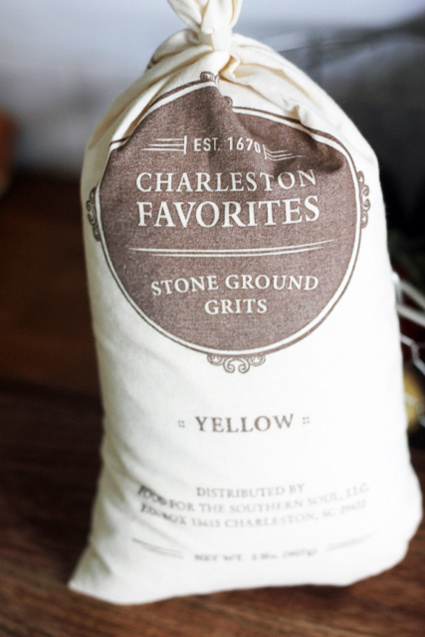 The name 'grits' actually derives from the Old English word "grytt," meaning coarse meal. The area stretching from Texas to Virginia is even sometimes called the "grits belt". While grits can be found in other parts of the U.S., it's Italian counterpart, polenta, is what is more commonly recognized and sold in Yankee territory. But, before you go and defile this treasured dish by suggesting that it's the same as polenta, I'll save you the inevitable shame of this comparison by telling you: it's not. 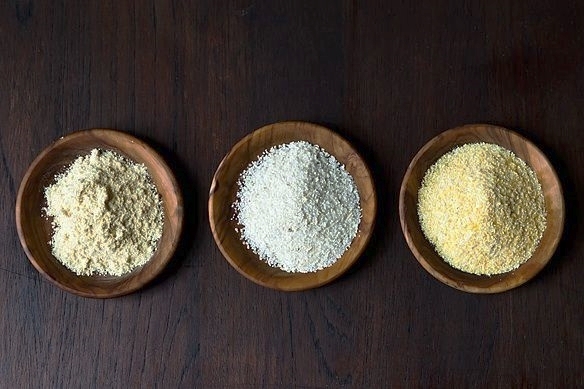 If you're curious just how polenta differs from grits, here it is: when corn is ground for cornmeal, the coarser particles become grits, while finer granules are used for polenta and the most fine particles become cornmeal. That 'grittier' texture gives grits their toothy feel and their distinct character as a base to so many iconic Southern dishes. Growing up in the South, there were many dishes that I loved, but there is one that I can't live without; creamy, buttery, golden grits. Eaten for breakfast, lunch or dinner and served with a variety of accompaniments like eggs and bacon, fried fish or spicy cajun shrimp, they are as versatile as they are ubiquitous. Since moving to Montreal 7 years ago however, I've had a difficult time procuring them and have often had to resort to begging family members into sending care-packages brimming with the essentials every Southern girl needs: grits, marshmallow fluff and cornbread mix. Many dinner parties have revolved around my native dish and introducing or 'indoctrinating' my friends here has inevitably resulted in a tiny enclave of grits lovers every bit as fervent as any true Southerner. Saying that, there are a few ways that I love to have them. Some of these are traditional recipes and some of them are new additions stemming from new ingredients I've fallen in love with during my travels. Heat the butter on medium high heat in a medium saucepan. After the butter has melted add onions and garlic and slowly caramelize for 2-3 minutes. Add the water and the salt and bring to a boil. Slowly whisk in grits and allow them to come back to a boil before lowering the heat to the lowest setting. Allow to cook covered for 15-20 minutes stirring frequently so the grits do not stick to the bottom of the saucepan. Slowly add the milk and continue cooking and stirring for 10 minutes. Remove from heat and sprinkle in the cheddar cheese and stir to combine. Serve warm with poached or fried eggs. Bring milk, salt, and 2½ cups water to a boil in a large saucepan over medium-high heat. Gradually whisk in grits until smooth. Reduce heat to low, cover, and cook, whisking occasionally, until creamy but still with some bite, 20–25 minutes. Remove from heat and whisk in butter and cheese; season with salt and pepper. Serve topped with chives. Preheat the oven to 425 degrees. Wash the tomatoes, place on a baking sheet, and pat dry. Drizzle with 1 tablespoon of the oil. Roast for 10 minutes, gently turn the tomatoes, and repeat until the tomatoes are browned, about 30 minutes. I turned the heat up to 450 at the end to get more browning action. Heat the remaining 2 tablespoons oil in a large heavy pan. Add the garlic and saute gently until fragrant, but do not brown - browned garlic tastes bitter and gross. When the garlic is smelling awesome, add the spinach and turn off the heat. You should be able to just keep stirring the spinach around for a minute and it will wilt and reduce in size. Transfer to a bowl and set aside. Wipe out the pan with a paper towel. In the same pan, bring the water to a boil. Add the polenta and whisk until smooth. Simmer for 15 minutes or so until the polenta has thickened. Add the goat cheese and the salt and stir until smooth. Taste and adjust as necessary. Serve the polenta immediately with the tomatoes and the spinach. Being far away from home can be hard, and sometimes the thing your yearning for most is just a hot cooked meal. Dig out those old recipes from your grandmother, search out your favorite hard to find ingredients and make a dish that reminds you of home. Invite a few friends over while you're at it, you might just found out you've made a new place to call home without even realizing it. Over here at Autumn Wood Stylist HQ we are sipping a glass of Rioja, reading Dune and dreaming of hot summer days... come on already Montreal! As always we are here for a friendly chat if you need a prop-stylist, photo-stylist or set designer. Just head over to our Contact Us page and drop us a line!